Location: Abrest, in the Allier departement of France (Auvergne Region). Built: 14th to 16th century. 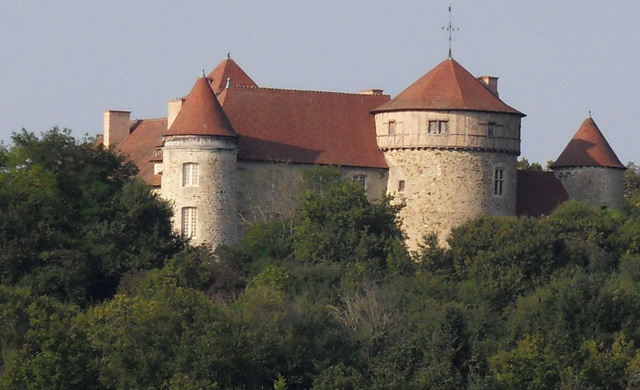 Notes: Château de Chaussins is a medieval castle in Abrest in the department of Allier in France. Castle (precisely the moat, facades and roofs but also vaulted room with its fireplace and arched, gothic fireplace, two fireplaces and renaissance wall paintings from the first floor) is the subject of a registration as historical monuments since August 5, 1980. It was built in the fourteenth century to the sixteenth century. In July 1794, the owner, Justin Louis Marie, the last marquis of Talaru who emigrated, Talaru of the properties are auctioned, and Chaussins is sold for 44,000 pounds to seven inhabitants of Abrest. The Logis L dates from the fourteenth century. The hexagonal tower that follows the house is circular inside. The other buildings surrounding the courtyard were built in the sixteenth century and the roof without the main building is from 1573 and the murder of the owner. The openings enlargements were made in the eighteenth century and the southwest tower was embattled in the nineteenth century. The set is surrounded by a moat.